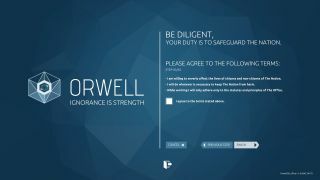 The second season of Orwell again lets you play a dystopian government spy again. Captain Oleg Bakay can't hide anything from me. I have his passwords, his military records, his text messages, audio recordings of his phone calls, the name of his daughter and which school she went to, all of it laid out on my screen. The only thing I don't know is why he's gone missing—and whether he'll still be alive when I find him. That's the opening gambit of Orwell, a text-based game about an overreaching government pushing out propaganda and crushing nationwide protests. You play a state official tasked with connecting 'chunks' of information on various websites and passing on anything relevant to your superiors so they can put a stop to the troubles. The first two episodes are already out, and the final, third part will release later this month. It feels less like a commentary on state power and more like a puzzle game. Your primary job is to build up profiles of the story's characters by nosing around their personal communications and dragging relevant passages into Orwell, the government's security program. Often, finding one nugget will open another line of inquiry and move the story forward, and some chunks will contradict one another. You have to figure out which one is true—and then decide whether you pass that on to the government higher-ups. I had hoped to decide exactly which segments of the various websites you're given access to were useful, but the game does the legwork for you by highlighting potentially relevant sentences. It can be hard to avoid the temptation to simply scan each page for the blue boxes, ignoring everything in between, but the game makes up for it by building up complexity in different ways. Orwell's cleverest trick is asking you to backtrack, investigating old leads in the light of new information. If you want, you can feed your boss information you know to be false, which will directly affect the characters in the story (it's often a matter of life or death). You're essentially manufacturing the truth, steering the story how you see fit. I didn't fully appreciate its flexibility the first time around. In the game's second chapter, which is where the meat of the story is, you're given two avenues to pursue towards a particular goal. I managed to exhaust both, finding them to be dead ends. I was still able to solve it through a third route, but not before a time limit I'd been given had passed, changing the story. I went back for a second run, this time deliberately passing on lies about one of the characters I'd been asked to investigate. That got them in big trouble, and completed my objective. The ending in that case was substantially different, and I'm interested to see how those two branches diverge in the third chapter. Orwell's cleverest trick is asking you to backtrack, investigating old leads in the light of new information. Early on I stumbled across the website of a school that was bombed during a civil war, but couldn't make anything of it. Later, on an unrelated trail, I discovered a story of a student that attended the same school. I could go back and check the name against the attendance records for a specific day, which ended up being central to the story. It's hardly Sherlock Holmes, but it feels good when you make the right connection. I also like the way that the text around the important information chunks builds a strong sense of place. You'll read news articles, weather reports, threads on Blabber (the equivalent of Twitter), and company websites, and it helps you get a feel for the fictional world, called The Nation, that the developer has created. Some pages have no information chunks and are there purely to color in the setting. The amount is perfect for dipping in and out of. By limiting this extra reading to short, sharp pages—no more than a screen’s worth at a time—the game lets you learn about the world without overwhelming you, and without making you feel like you're spending too much time off the main path. It works very well. So far, so good. Unfortunately, the actual writing of the story lets it down. It's not bad, but when you're spending 90% of the game reading then you expect the narrative to do a lot of heavy lifting. It has a few too many clichés, which is fine for an inconsequential news report, but more troubling when it comes to characters. Orwell doesn't feel like a commentary on government power, but I don't think that's for lack of trying. They never quite feel like real people. It's as if the writers have a list of traits and attributes they’re trying to get across in everything that every character says. The most prominent figure, an anti-establishment journalist, feels like a caricature, with revolution and conspiracy apparent in virtually everything he says. There are a few personal asides—conversations between him and his wife, for example—but I never quite believed in him, and the dialogue itself is a little stilted and awkward. The story has a few jarring moments too, such as when a therapist gets angry at a patient for no good reason. It's completely at odds with her job and with what we've learned about her up to that point. Perhaps it's meant to show a character flaw, but it was too heavy-handed and pulled me out of the world entirely. I said earlier that Orwell doesn't feel like a commentary on government power, but I don't think that's for lack of trying. If the characters had stuck, and if I'd genuinely cared about what happened to them, then I might feel bad about putting one or another of them in the firing line based on something they didn't do, which in turn might make me confront the real-world issues it's trying to touch on. That simply doesn't happen. I also ran into problems with the game's inflexible system for uploading information chunks. At one point you have to enter a patient's name into a clinic's database. You can't type, so you have to click and drag the name in manually. That's fine, but for some reason the name wasn't showing up as something that I could interact with. It stumped me for a good 20 minutes before I realized that the name was on multiple pages, and I could only drag it from one of those pages. Annoying, to say the least. Despite these flaws, I still feel Orwell: Ignorance is Strength is a game worth playing. I haven't really touched on its episodic structure here (each episode is between 60 and 90 minutes), because it's easy enough to just wait for the third episode to come out on March 22 and then make a decision, which is what I'd recommend. I'm not itching to play that final portion, and I'll probably forget about its story the minute the credits roll. But I will play it: as a text-based puzzle game it has some good ideas, and I'm curious to find out just how much chaos my campaign of misinformation will cause.